This is only the third time this month that the temperature has failed to reach 100° at Austin. Temperatures are once again forecast to be in the upper 90s in the region on Saturday. Tropical Storm Danny developed this morning from an area of showers and thunderstorms northeast of the Bahamas. The storm is expected to develop into a hurricane which could potentially threaten the East Coast within 3 to 5 days. At 11 am EDT, the storm was moving west-northwest at 18 mph from a position about 775 miles south-southeast of Cape Hatteras. Forward speed is expected to decrease through tomorrow. Based on NOAA aircraft reconnaissance, maximum winds are 45 mph; some slow strengthening is possible in the next couple of days, and the storm could become a hurricane off the North Carolina coast. The current forecast from the National Hurricane Center shows a 30% or greater probability of tropical storm force winds along much of the East Coast from North Carolina northward. August 26 Midnight Update: This is now the 66th day of 100°+ temperatures in 2009 at Austin/Mabry, 3 short of the record in 1925. 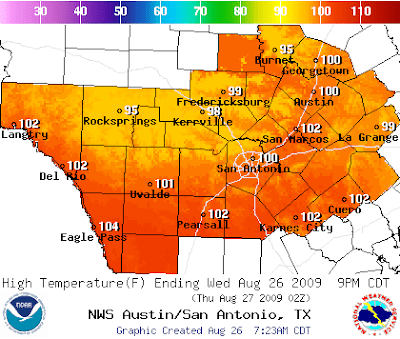 August 26 3 pm Update: The temperature has already reached the century mark by mid afternoon at Austin/Bergstrom, Austin/Mabry (101°), and McAllen. A RECORD HIGH TEMPERATURE OF 103 DEGREES WAS SET AT WACO YESTERDAY. THIS TIES THE OLD RECORD OF 103 SET IN 2006. August 26 Update: Today's forecast shows the likelihood of 100°+ heat across much of the area again today. 11 pm Update: Highs updated through 5 pm and south Texas locations added. 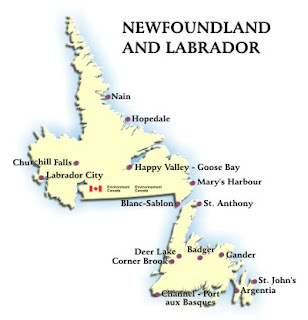 Map previously shown was incorrect and has been deleted. The temperature has now reached 100° or higher every day this month at Austin except for the 2nd and 19th. The overall monthly average of 90° is 5.2° above the long-term average and well on its way to breaking the all-time August record. DEGREES SET IN 1970 AND TIED IN 2002. A RECORD HIGH TEMPERATURE OF 106 DEGREES WAS SET AT MCALLEN TODAY [Sunday]. THIS BREAKS THE OLD RECORD OF 102 DEGREES SET IN 1958. YESTERDAY [Saturday]. THIS TIES THE OLD RECORD OF 104 SET IN 1997. On average, July is the hottest month in Washington, DC. The 1971-2000 base period average for July of 79.2° is nearly 2° warmer than the 77.4° August average. For much of the current decade, however, the months have reversed roles, and 2009 is turning out to be one of the most extreme examples in history. The August average through the 22nd is 80.7°, not only 3.8° above the cool July, but well above the historical July average. In the decade of the 2000s, 7 out of the 10 years, including this one, have had warmer Augusts than Julys. There was only one such year in the 1990s; that was 1998. The most recent year before that was 1984. This means that in the last 25 years, 7 out of the 9 "upside-down" Augusts have all occurred in the most recent decade. In 139 years of Washington, DC records, the July-August reversal has been observed only 31 times, nearly one quarter of them in the current decade. If the 3.8° excess of this August over July holds through the end of the month, it will be second only to the 4.4° difference in 1895. 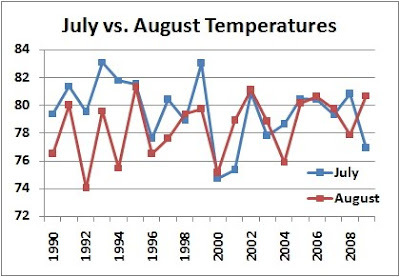 That July was the second coldest in history, however, while this July was much closer to average. OF 101 DEGREES SET IN 1988. August 24 Update: As of 3 pm CDT, temperatures have again reached 100° at Del Rio and 102° at Austin/Mabry; San Antonio is 96°. THIS DATE LAST SET IN 1878. TIES THE RECORD HIGH FOR AUGUST 23RD...SET IN 1949. RECORD HIGH, LAST SET IN 2007. 98 DEGREES, SET IN 2007. HIGH, LAST SET IN 1988. AIRPORT TODAY. THIS BREAKS THE OLD RECORD OF 92 SET IN 2006. A RECORD HIGH TEMPERATURE OF 96 DEGREES WAS SET AT LANDER TODAY. THIS BREAKS THE OLD RECORD OF 93 SET IN 2006. A RECORD HIGH TEMPERATURE OF 97 DEGREES WAS SET AT CASPER TODAY. THIS BREAKS THE OLD RECORD OF 95 SET IN 1971. TODAY. THIS BREAKS THE OLD RECORD OF 90 SET IN 2006. With a little over a week left in the month, south-central Texas continues to be on track for the hottest summer in history. Through August 22, the average temperature since June 1 is the highest ever recorded in Austin and San Antonio, and the second highest in Del Rio. The average in San Antonio is 1.6° above the previous record and 1.8° above the record for the entire June-August period. RECORD OF 104 SET IN 1917. MABRY TODAY. THIS BREAKS THE OLD RECORD OF 103 SET IN 1917. 100 DEGREE DAYS IN A YEAR IS 69 DAYS WHICH WAS SET IN 1925. Austin had 16 100° days in a row ending on the 18th, and there have been a total of 62 so far this year through the 22nd. Del Rio has had 60 100° days, and San Antonio Stinson Field has had 64. 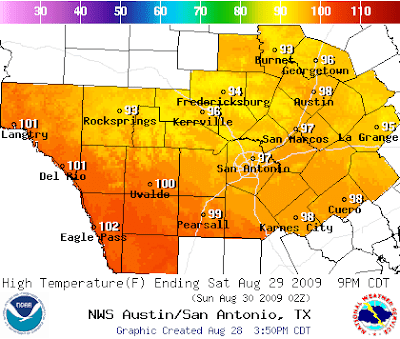 Here are the 100° days for 2009 so far as reported earlier today by the National Weather Service.